Little Wonder Optimax blowers are the best-designed blowers in the world… known for unmatched leaf-blowing efficiency. 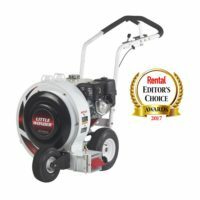 Little Wonder Optimax blowers outperform the competition for moving stubborn debris, removing standing water, preparing asphalt or flat roofs for resurfacing, or for any job that requires hurricane-force air! Durable, solid-steel construction. This model offers a Honda GX390 4 stroke engine. Unique split-stream air deflector moves piles of leaves farther and faster; without blow-back! Transport bracket for convenient tie-down during transport. Convenient lift handle makes lifting the blower on and off the truck easier.